@fluffypillow I hate to be a dissenter but what does this add apart from a lot of flash and eye-candy? Does your new front end add any actual functionality? Looks really good! I will look into trying this out after I'm done making a secret (for now...) creation of mine. @fluffypillow Does this, let's say, framework have some kind of interface to shell scripts. I mean, provide some GUI widgets like kdialog. IMHO this would be a real game changer. @PokeEngineer Is what you're working on the why you haven't been on in 2 months? Nah. I was just taking a break. @AlexMurphy Technically, none of the frontends provide anything you couldn't do with a set of shell scripts and manually edited config files :) The difference is the user experience, I guess. Would you like to see any particular feature? I'm open to ideas. It's just simply that I was not 100% pleased with the currently available frontends, so started working on a new one to make it to my liking. @meleu Actually, I do was playing with the idea of making a dialog alternative; that'd allow to even theme the whole menu system. Qt doesn't ship with such a program out-of-the-box, but provides all the UI elements to build one. @shantigilbert Ah I see it's a 64-bit ARM system; it might need some manual compiler flag definition or tweaks. Depending on you device, you'll likely have to create some config files, based on eg. the one for RPi 3 in qtbase/mkspec/devices. Also Qt 5.9 comes out next week (official releases come twice a year), you might want to try that too. @fluffypillow it is a 64bit, but I am using an arm 32bit arch to compile it. I will wait for 5.9 and see if there is better luck :D thanks! I am so used to SNES controllers lately, seeing ABXY in that format threw me off initially. @LiveFastCyYoung I'm thinking about adding an AB <-> BA switch option, and also a PS-style layout too. It won't be complete yet though; for the beta release, I want to add user theme support, a custom metadata format (to not depend on ES), script support, a nice icon/logo, some help texts (eg. 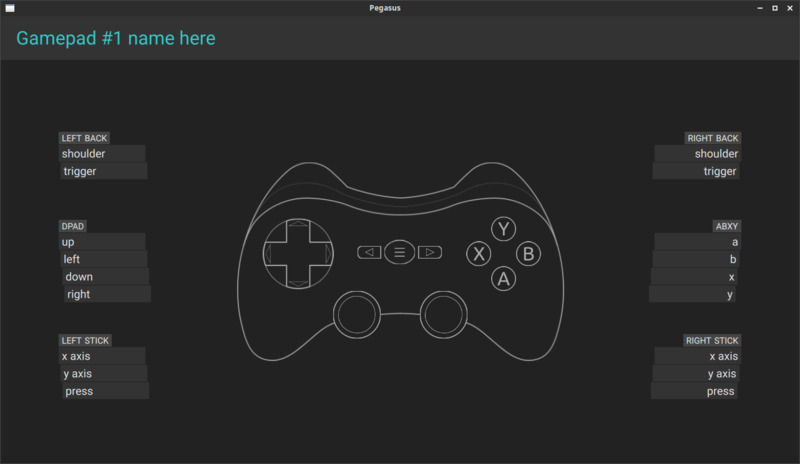 "you don't have any games"), retropie install script, maybe steam support, and also write a theming tutorial. Man, I really appreciate your hardwork. And it's incredible that you're doing that alone. As for now, the only true alternative to a physical collection are flashcarts along with an a mod like UltraHDMI.